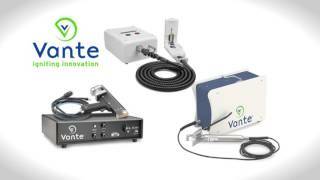 The Vante RUBY System is an improved catheter manufacturing system delivering high reliability, throughput and yields along with an improved control interface for superior automation integration. Enhanced functionality for RUBY include “Smart Mold”, a patented feature, provides the ability for parametric data to be stored in the mold module for transfer to any RUBY system automatically. The mold assembly is designed for easy installation and removal from the platform. Process parameters are loaded quickly and reliably via system configuration sensing and software control. Digital pressure regulation provides improved pressure control and alarms when pressure tolerances are not met. Additionally, pre-assigned programs stored externally to the generator can be accessed and loaded via limited modbus capabilities. Turn key solution. Vante application engineers certify that parts meet your drawing specification prior to shipment. Change molds and process a different application within seconds. Two screws release the tooling. Heaters and thermocouples are contained within each mold so no adjustment is necessary! System design allows for temperature gradients from 350C to ambient within 0.5mm. This enables designers to create high tolerance applications and limit flash by stopping plastic flow.